Summary: This report presents a rare case of multiple, widely spaced arteriovenous malformations in a single patient treated with linear accelerator–based radiosurgery. The choices associated with the requisite imaging and planning are presented. In light of the anatomic topography, linear accelerator–based radiosurgery was chosen over gamma knife treatment, with CT angiography being used to image all target areas simultaneously. Stereotactic radiosurgery is a well-established treatment technique for arteriovenous malformation (AVM; 1). Both the probability of obliteration and complications are modeled (1, 2). The established modalities of treatment are modified linear accelerator (3) and gamma knife (Elekta AB, Stockholm, Sweden; 4). The procedures on the treatment day generally follow an established pattern regardless of the technique: fitting a rigid frame, followed by imaging within a stereotactic coordinate system and treatment before frame removal. A number of stereotactic frame systems exist with this medical center by using the BrainLAB Cosman, Roberts, Wells–type pinned system (BrainLAB AB, Munich, Germany) for single fraction cases. Imaging for AVM patients undergoing radiosurgery has evolved from orthogonal, plane angiography to include cross-sectional techniques (CT/MR; 5). A more recent addition to the imaging armamentarium is CT angiography (6). This technique combines a map of arterial flow and venous drainage through the AVM nidus with a thin-section, multislice CT scan. CT angiography is generally the sole choice of imaging technique at this institution because it provides all the required information for treatment planning without the invasiveness of conventional angiography. Despite AVM radiosurgery being an established technique, the occurrence of multiple AVM nidi within the same patient is rare (7–9) and poses therapeutic challenges. We present a case with four anatomically separate AVMs to highlight our choices of imaging evaluation and treatment. All radiosurgery cases treated at this institution are first discussed at a multidisciplinary meeting where the various merits of neurosurgery/radiation therapy and so forth are expounded. The patient was a 60-year-old white woman with a history of subarachnoid hemorrhage secondary to a ruptured right posterior communicating artery aneurysm, for which she received clip obliteration in April 1997. She had no family history of aneurysm, hereditary hemorrhagic telangiectasia or AVM. 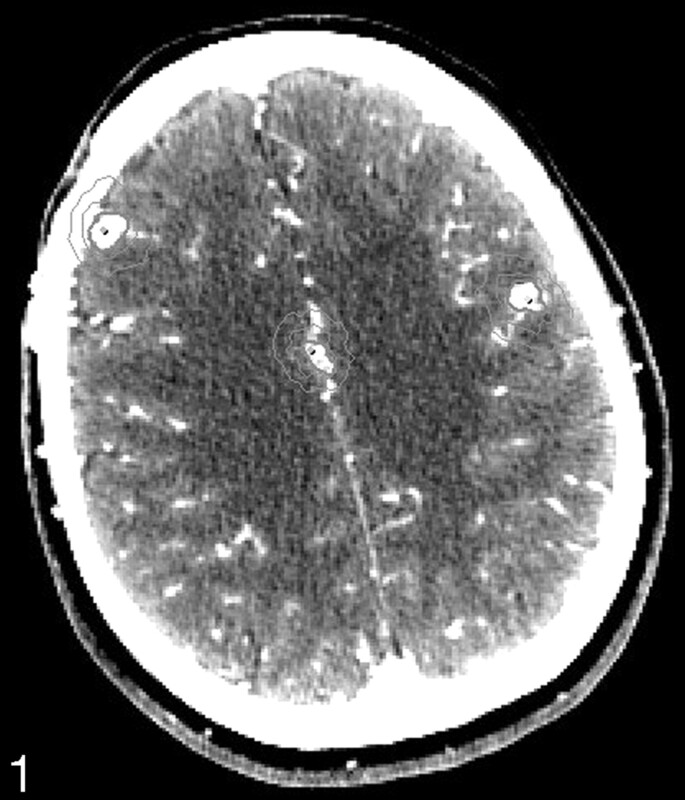 During the patient workup for her subarachnoid hemorrhage, she was found by cerebral angiography to have four small, high-flow AVMs. Follow-up angiography was performed in June 2001 and showed four small nidi of AVM measuring between 1 and 1.5 cm in diameter. The first AVM was found near the midline in the posterior frontal lobe, receiving its supply from the anterior cerebral artery, and the second located in the frontal region, receiving its supply from middle cerebral artery branches. In addition there was a small (again, 1-cm diameter) nidus of AVM on the frontal left side, receiving its supply from middle artery cerebral branches. A fourth AVM was also identified (<1-cm diameter), located in the lateral posterior right cerebellum, receiving blood supply from the right posterior, inferior cerebellar artery. The size and location of the nidi were as follows, with volumes based on the outline of AVM drawn at the time of planning on CT angiography (CTA) images: left frontal, 0.32 mL; right cerebellum, 0.31 mL; right frontal, 0.37 mL; right paramedian frontal, 0.28 mL. This case was discussed at a multidisciplinary planning conference, where the options and merits of surgical resection, radiosurgery, and observation were raised. Open surgery for all four nidi was not recommended, because of the multifocal nature of the AVMs, the presence of multiple targets, and in consideration of the deep-seated position of at least two of the target areas. The option of resection of the most accessible nidi with radiosurgery to the deep-seated targets was raised, but the patient refused open surgery. Thus, the recommendation was for the patient to receive LINAC-based radiosurgery with micromultileaf collimator. In preparation for radiosurgery, the patient received a CT angiogram. This showed four focal areas of abnormal enhancement in the inferior right cerebellum, right parafalcine frontal lobe, right peripheral frontal lobe, and left frontal lobe—correlating to the patient’s four angiographically described AVMs. The patient had a Karnofsky performance status of 100 (no deficits) and no neurologic deficiency before the procedure. Because of the widespread nature of the various AVMs linear accelerator–based radiosurgery was chosen over gamma knife treatment. Although the gamma knife offers a rapid dose fall-off and the ability to treat multiple targets (10), the stereotactic space is somewhat limited, leading to eccentric frame placements for peripheral targets. From measurements of the patient’s diagnostic films, it was concluded that all four targets could not be treated with the gamma knife without frame replacement. 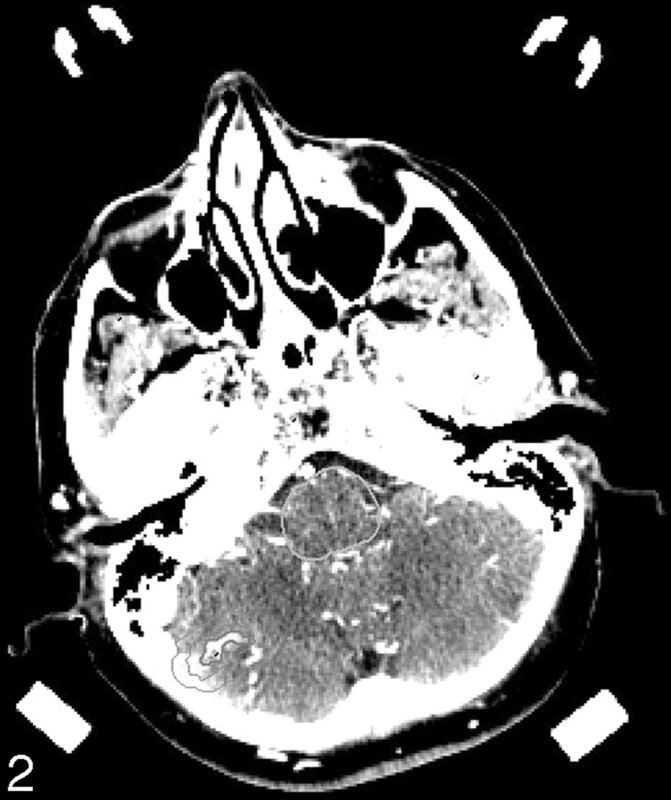 Although tolerable, frame replacement would have prevented a full appreciation of the total brain dose through the calculation of one-dose-volume histogram with all four targets inside. It has been shown that the probability of obliteration of intracranial AVM is related to the minimum dose delivered to the nidus (1); furthermore, a recent study (11) has shown that linear accelerator–based planning delivers a higher dose minimum to a radiosurgery target when compared with an equivalent gamma knife plan (for the same percentage target coverage), by inference giving a higher probability of obliteration of the AVMs in this case over a gamma knife treatment. In addition, linear accelerator–based radiosurgery was chosen for the increased patient comfort and ease of all four AVMs treated by one frame fit and treatment session. The treatment session itself took <2 hours to complete. CT angiography was performed by using a GE Lightspeed 16 detector scanner (GE Medical Systems, Milwaukee, WI) by using 1.25-mm-thick, contiguous sections from vertex to skull base. The scan was performed with the head frame in place, (120 kV, 340 mA). Contrast was injected at 4 mL/s for a total of 150 mL following a 20-mL timing bolus. Axial images showing the AVMs are given in Figs 1 and 2. Superior planning CTA section showing three AVM nidi and isodose lines at 87% and 44% of the maximum dose. Inferior planning CTA section showing the fourth AVM nidus and isodose lines at 87% and 44% of the maximum dose. The planning was accomplished by a total of 16 fixed fields, four per AVM and one isocenter per target. Previous work has demonstrated the efficacy of fixed fields over arcs for increasing the conformity of radiosurgery plans for irregular targets. In addition, although some authors have advocated the use of a relatively high number of fields for radiosurgery (23), it has been shown (as is the case here) that a highly conformal and easily manageable plan can be delivered with four to six fields (12) per isocenter. The advantage of a small number of fields for multiple targets is that the beams can be separated to avoid each other on both entrance and exit, thus minimizing the dose burden to normal tissue. A dose of 20 Gy was prescribed to the global 87% isodose line, and the total dose distribution was normalized such that the maximum dose was 100%. The dose-volume histogram of each AVM was assessed to ensure each target was completely covered by the prescription isodose, giving a (relatively high) minimum dose to the target of 20 Gy, which is accepted clinically as it is balanced by a high probability of obliteration. From the published literature, this treatment strategy should give a probability of obliteration >80% for each nidus, independently (1). Accurate calculation of a combined probability for all nidi (the desired result) is not possible—there are no published data on this—but the expectation is for a similar or slightly lower probability of obliteration. In addition, the whole-brain dose volume histogram was studied to determine the volume of tissue receiving 12 Gy or more, to give a measure of the complication probability (2). The 12-Gy volume was measured as 10.2 cm3 (or 2.6 cm3 per AVM). The “location” of the AVM nidus, however, is a major determinant for long-term symptomatic postradiosurgery injury (2). Between the four AVMs, the right paramedian frontal lesion, being close to the corpus callosum, is located at the most “vulnerable” area (2). In general radiosurgery carries a low risk of complications/acute adverse events, as evidenced by the report of Chin et al (13) and even when all “new or unexpected symptoms” are considered (14), risk/benefit considerations strongly favor radiosurgery as the management option for this rare case. Reports of multiple intracranial AVM exist, but none report treatment options. We have demonstrated that stereotactic radiosurgery, utilizing modern linear accelerator technology and thin-section CT guidance is a viable management option for the rare condition of multiple AVM. In this particular example, the patient had no complications 15 months postirradiation related to the radiosurgery and follow-up imaging was scheduled for 24 months as per established guidelines (1). Accepted after revision September 17, 2004.